Apple announces February launch for its HomePod smart speaker | What Hi-Fi? The HomePod will finally go on sale on Friday, 9th February - will it be the smart speaker we've been waiting for? It was coming. Then it was delayed. Now it's here... well, nearly. Apple has announced that the HomePod will go on sale in the US, UK and Australia on the 9th February (France and Germany have to wait until Spring). The £319 smart speaker will be available to pre-order from Friday, January 26th. 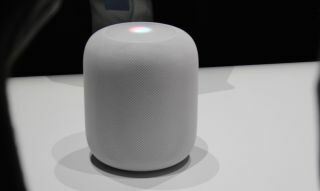 The HomePod was first announced at Apple's Worldwide Developer Conference in June 2017 but in November, Apple announced it had been delayed until 2018. When it finally lands, the smart speaker will be competing in a market which already includes the likes of the Amazon Echo and Google Home, not to mention other speakers which feature built-in Google Assistant, Alexa and other virtual assistants. According to Phil Schiller, Apple’s senior vice president of Worldwide Marketing, the HomePod will bring "advanced audio technologies like beam-forming tweeters, a high-excursion woofer and automatic spatial awareness" that makes him think people "will be blown away by the audio quality." Whether this "magical new music experience" (Schiller's words) will live up to the hype remains to be seen. Needless to say, you'll be the first to know - keep an eye out for our exhaustive First Test!